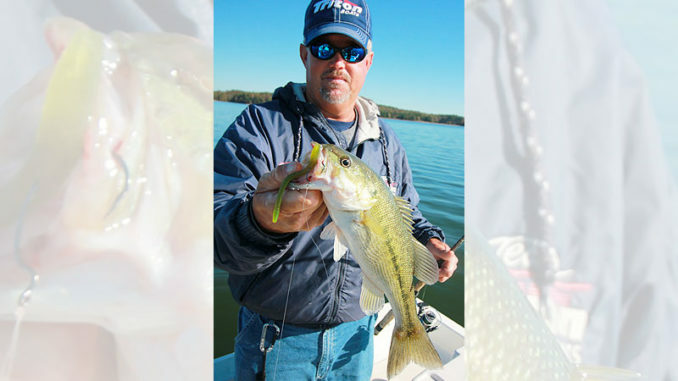 Lake Russell spits out plenty of nice spotted bass, even during the winter. 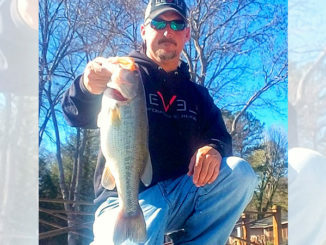 Although an occasional largemouth will show up in the bag, winter bass fishing on South Carolina’s Lake Russell is mainly for spotted bass, according to guide Jerry Kotal of Elberton, Ga.
“By January, if we don’t have a warm winter, the bass will probably be in the creeks or out on drops in the main river. We will be catching them from 30 to 60 feet deep,” said Kotal. 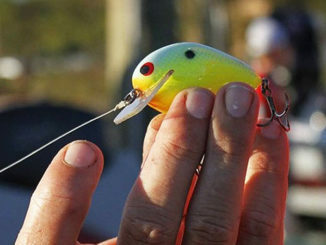 Locating bait is the key to catching Russell bass this time of year, he said. A graph is a necessity to locate the baitfish, primarily threadfin shad — although there are also some blueback herring in the lake, too. Kotal (706-988-0860) likes a 5/8-ounce jigging spoon, either chrome or white with reflective tape. Sometimes, he will go with a ¾-ounce spoon. He said the brand doesn’t matter. For a drop-shot, Kotal rigs with a finesse worm in green, light brown, green pumpkin or watermelon. If his guide party is not adept at this type of fishing, Kotal uses a live minnow instead of the finesse worm on the drop-shot rig, he said. 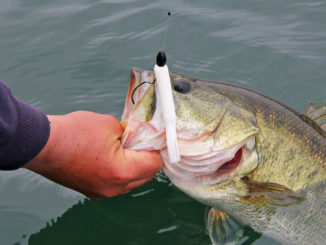 Whichever technique he uses, Kotal said a good day on the lake can produce upwards of 100 bass, anywhere from 1 to 4 pounds and occasionally one up to 5 pounds. Plus, anglers catch plenty of bonus species, he said.